Herodotus – the Father of Lies? Herodotus has been called both the Father of History and the Father of Lies. Although his Histories are our primary source for knowledge of the Persian invasions of Greece in 490 and 480 B.C., Herodotus’ account includes some elements which seem to us incredible, sometimes almost bordering on the realm of fantasy. It is important to bear in mind the literary context in which the Histories were written. There was no established tradition of history which Herodotus could follow. Given that the Histories would have primarily been for public recitation (rather than, as for the modern reader, personal reading), there had to be some element of entertainment, and Herodotus gives us this with some frequency… from the visit of Solon, the Athenian lawgiver, to the Lydian capital of Sardis, to King Xerxes giving the Hellespont 300 lashes after a storm destroys the bridge he has had built, and, more fancifully, accounts of man-eating ants in India. Additionally, direct speech plays quite a prominent role in Herodotus and it would be wrong to suppose that he was attempting to reproduce such speeches verbatim – rather, the words he puts into the mouths of the protagonists are likely to be partly from an oral tradition and partly of Herodotus’ own invention. Such speeches can often be seen as an explanation of the events which are described in the narrative, but also give us some insight into the perceived nature of the main players. Some aspects of Herodotus may, therefore, seem out of place in a historical account, but that is to impose on him a later model of historical writing. To a large extent his Histories reflect his own interest. Although it is almost certain he did reside in Athens later in his life (and his account, though criticised in its own time for being pro-Persian, does actually take a largely Athenian standpoint), he was born in Halicarnassus (Bodrum, in modern Turkey) in 484 B.C. when it was still under Persian control. He is clearly well travelled – he tells us when he has seen sites first hand – and is thought to have visited, inter alia, Babylon and Egypt. In addition to history (as we understand it) the Histories covers geography, natural history and ethnography (including the customs – often bizarre – of several peoples). However, while there is no doubt that Herodotus is a natural storyteller, he is no naïve dupe. 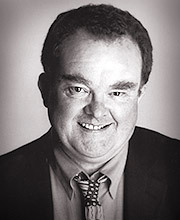 He often exercises judgment by expressing an opinion when putting forward several different versions of an event. Unlike Thucydides, writing a generation later, he usually offers the evidence from which his conclusions are drawn. While Thucydides is often more didactic, this is not to say that Herodotus’ work is itself without any overriding message, published as it was at the beginning of the Peloponnesian War between Athens and Sparta (which turned out to be a catastrophe for Athens). Elements of Greek tragedy pervade the narrative – Xerxes, most of all, shows hubris and is therefore eventually undone (nemesis coming into play). In other instances, ambiguous divine messages, most often emanating from the oracle of Apollo at Delphi, lead to the downfall of the mighty. 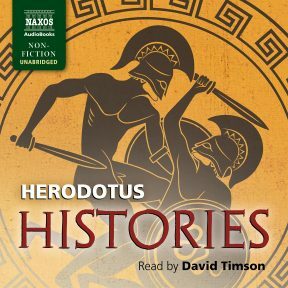 The vastly experienced David Timson reads our new audiobook of the Histories. As a consummate storyteller his voice is ideally suited to Herodotus’ avuncular style and the recording never fails to both educate and entertain.